Emotional Brain is developing personalized medicines and a companion diagnostic for female sexual dysfunction, with a focus on sexual desire. Since the launch of Viagra (sildenafil) in the late 1990s, male erectile dysfunction has been more openly discussed than ever before, with a market for drug treatment worth over $4.82 billion in 2015. Emotional Brain is hoping that its research will open up a similar market for female sexual interest/arousal disorder (FSIAD), which is seldom spoken about and currently has only one specifically approved treatment in the United States and none in Europe. FSIAD is defined as a persistent lack or absence of sexual interest or arousal, and can have a real impact on women’s quality of life and well-being. Although it’s not clear how many women FSIAD affects, it might be as many as one in ten or more, based on the litera­ture. Creating and commercializing a successful drug for this significant, and as yet little exploited, market could be a real opportunity for the pharmaceutical industry. Emotional Brain predicts a global market for its therapeutics Lybrido and Lybridos peaking at over $2 billion around 2029. Emotional Brain’s research has focused on unraveling the underlying causes of FSIAD, in order to specifically target those causes instead of adopting a one-size-fits-all approach. According to the company’s inves­tigations, there are two subgroups of women with FSIAD. In one subgroup, low levels of sexual motiva­tion and desire result from low levels of sensitivity to sexual stimuli and cues. In this group, an initial dose of sublingual testosterone increases the sensitivity of the brain to sexual stimuli. Following this with an oral dose of a PDE-5 inhibitor can increase sexual desire and thereby sexual satisfaction. In the second subgroup, the women’s low levels of motivation and desire result from overactive sexual inhibition caused by an increase in serotonergic activity. In these women, sublingual testosterone can increase sensitivity to sexual stimuli, and a subse­quent dose of a 5-HT1A-receptor agonist then inhibits the sexual-inhibition mechanism. Figure 1: Lybrido & Lybridos. Dual-route dual-release drug-combination tablets: pharmacokinetic and pharmacodynamic profiles. On the basis of these observations, Emotional Brain has developed two on-demand combination thera­peutics for these two subgroups of women, along with a companion diagnostic that uses genetic mark­ers to predict responses to treatment. Lybrido combines a menthol-flavored coating of testosterone and an inner core of the PDE5 inhibitor sildenafil. 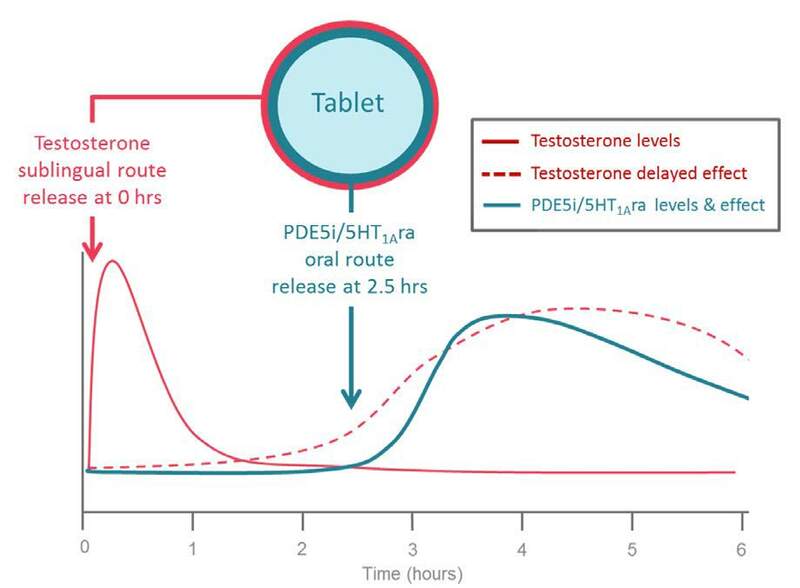 The testosterone and PDE-5 inhibitor are released so that the peak plasma concentration of the PDE-5 inhibitor coincides with the 4-hour delay in behavioral effects of the testosterone. Lybridos is a similar combination tablet with a coating of testos­terone and a core of the 5-HT1A agonist buspirone (Fig. 1). Patients hold the tablet in their mouth for approxi­mately 45 seconds until the menthol flavor disap­pears, allowing the testosterone to be absorbed. The rest of the tablet is swallowed, and the second drug in the core is released after around 2.5 hours. Lybrido and Lybridos have both completed phase 2b studies in the United States, with results showing statistically significant and clinically relevant improvements in sexual desire. There was a much higher number of satisfactory sexual events (SSEs) compared with that observed after treatment with competitive products. Lybrido and Lybridos also show fewer side effects, and have no interaction with alcohol. No safety issues were observed with the combinations in phase 2 studies. To support approval by the US Food and Drug Administration and the European Medicines Agency, Emotional Brain has created a simple companion diagnostic based on a collection of single-nucleotide polymorphisms in genes involved in sexual behavior and function, along with a phenotype-prediction score based on a double-blind, randomized, cross-over, placebo-controlled study. The next step will be a small bridging study to validate the companion diagnostic, and then phase 3 trials for the two drugs, each trial involving around 550 premenopausal patients. The co-primary end­points will be the change in the number of SSEs and the change in distress, with changes in desire and arousal as key secondary endpoints. Emotional Brain has regulatory go-ahead for these pivotal studies, as well as agreement on primary and key secondary endpoints. The company is seeking partners to sup­port further development. Lybrido and Lybridos have patent protection to 2028/2030, with composition and process patents to 2032/2037. Around one-third of men with erectile dysfunction don’t respond to PDE5 inhibitors such as sildenafil. Lybrido and Lybridos may have potential in this group, particularly if the issue is a result of low sensi­tivity to sexual cues or an overactive sexual-inhibition system. Other potential therapeutics in earlier stages of development include treatments that could improve attention and memory in elderly people, or in those with deficits as a result of the side effects of tamoxifen. The platform technology underlying the diagnos­tics also has the potential to be used to predict treat­ment outcomes in patients with a variety of psychiat­ric and physical disorders, providing an opportunity for partners. Emotional Brain is based in Almere, the Netherlands, and conducts fundamental scientific research into the causes of female sexual dysfunction and clinical research into treatment options. Two new on-demand drugs with blockbuster potential, Lybrido and Lybridos, are in development. Moreover, Emotional Brain recently developed a novel method, based on genotyping using Single-Nucleotide Polymorphisms (SNPs) resulting in Phenotype Prediction Score (PPS) associated with traits and treatment effects. This innovative genetic method can be applied for the prediction whether someone is a responder or a non-responder to drug use (or traits). Other products are in early development stage. Over the years, Emotional Brain has published numerous well-cited papers in respected, peer-reviewed scientific journals such as Archives of General Psychiatry, the Journal of Sexual Medicine, Psychoneuroendocrinology and the British Journal of Clinical Pharmacology.